Three Israeli settlers were killed Friday in an alleged stabbing attack in the occupied West Bank, according to the Israeli military. "A Palestinian infiltrated a private home in the community of Neve Tsuf, northwest of Ramallah, and stabbed four Israeli civilians," a statement said. "Three of the victims died as a result of their wounds, and another was evacuated to the hospital." The Palestinian attacker, according to the army, was shot and injured. The 20-year-old Palestinian assailant, identified as Omar al-Abed, wrote in a pre-attack Facebook post that he planned to avenge what he alleged was Israel's "desecration" of the Jerusalem holy site. Hamas said the attack was in response to the violations against the Jerusalem residents and Al-Aqsa Mosque and warned that the Israel government would bear the consequences of its "racial and radical policy" against Palestine. Early Friday, three Palestinian men were shot dead and hundreds of others were injured in Israeli-occupied East Jerusalem. The killings came as Palestinians and Israeli security forces clashed after security restrictions were placed on the Al-Aqsa Mosque compound. 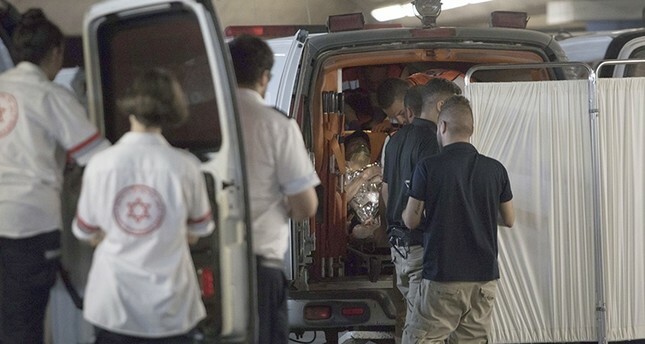 The Palestinian Red Crescent Society said the injury toll stood at 391. Apart from wounds from live ammunition, rubber bullets and tear gas, some victims said they were run over by Israeli armed forces vehicles. Other clashes between angry Palestinian youths and Israeli forces broke out in several cities across the West Bank after Friday prayers. Protests erupted Sunday after the mosque's leadership spoke out against metal detectors that were installed following a gun attack last week that left three Palestinians and two Israeli police officers dead. The measures led to a wave of anger among Palestinians, who called for the immediate removal of the detectors. However, Israel has refused to back down, saying the detectors match security measures at other holy sites around the world. On Saturday morning, Israeli troops searched the assailant's family home in the West Bank village of Kobar and detained one of his brothers, the army said. Video footage released by the military shows soldiers leading away a handcuffed and blindfolded man. The army said soldiers searched the house and measured it in preparation for eventual demolition. Ibrahim al-Abed, an uncle of the assailant, confirmed the family was told the house would be destroyed. The uncle said his nephew had been arrested three months ago by security forces of Palestinian President Mahmoud Abbas, who presides over autonomous enclaves in the Israeli-occupied West Bank. The uncle said his nephew had endured two weeks in detention and was violently interrogated about alleged plans to attack Israelis before he was released. Abbas has rejected such claims, saying Israel's 50-year-old occupation of lands sought for a Palestinian state is at the root of widespread anger and helps drive violence. Abbas has been a staunch opponent of violence, and in 12 tumultuous years in power always stuck to security coordination between his forces and Israeli troops against a common enemy — his rivals from Hamas, which Israel considers a militant group. On Friday evening, Abbas announced that he would "freeze" ties with Israel "on all levels" until the metal detectors are removed from the shrine, but did not say whether this means halting security coordination. Ending security ties would have far-reaching repercussions and sharply raise tensions with Israel. Israel's military said Saturday it sent more troops to the West Bank. It did not elaborate but said the decision came after hundreds of troops were deployed Friday. Israel's chief of staff and defense minister visited the Halamish settlement, the scene of the stabbing attack, on Saturday. Israel occupied East Jerusalem during the 1967 Six-Day War. It later annexed the city in 1980, claiming all of Jerusalem as the Jewish state's "eternal" capital -- a move never recognized by the international community.